Last week we saw the wool market settle and this week was much the same for the Merino market. Although, that can’t be said for the whole wool market, the crossbred section ran to it’s tipping point and conceded significantly on previous levels. The Eastern Market Indicator (EMI) fell slightly, ending the week at 1849 cents. The Au$ was weaker, closing at 0.723 US cents. That put the EMI in US$ terms at 1,336 cents, a loss of 25 cents (Table 1). In the west, the Western Market Indicator (WMI) was unchanged on the week at 2009 cents. Compared to the original roster posted last week, 38,315 of the 39,500 bales intended for sale this week came to the market. The solid market meant growers only passed in 10.3% of bales offered. This resulted in a clearance to the trade for the week of 34,365 bales (Figure 2). In the auction weeks since the winter recess, 580,389 bales have been cleared to the trade. The dollar value for the week was $69.98 million, for a combined value of $1.47 billion so far this season. The crossbred sections rally came to an end this week. Wool greater than 30 micron lost between 50 and 130 cents. 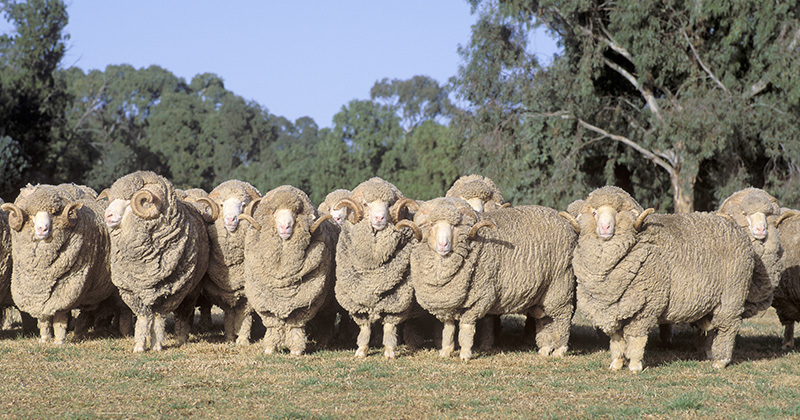 AWEX reported that the sharp reduction in price was met with firm seller resistance with nearly 20% of crossbred wool being passed in. Merino fleece had a solid week, particularly in the North. Most microns posted small increases. The oddments market fell between 10 and 20 cents. 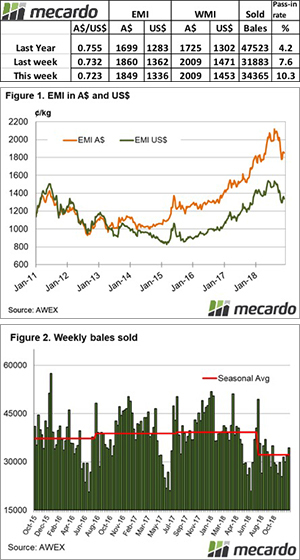 Christmas is just around the corner, at least for the wool market, with 1 more week of sale prior to the break. 48,777 bales are on offer across the three selling centres on Wednesday and Thursday.